Wait! Wait! I never got a chance to love you! Note to my streaming radio channel: White Lion‘s “Wait” is not classic rock. It’s a classic. It’s rock. But it’s not classic rock. Keynote talks by Pierre Omidyar & Scott Cook, the head of eBay corporate strategy, and the head of eBay corporate architecture. Business talks and panels by Digg founder Kevin Rose, SocialText founder Ross Mayfield, SixApart’s Anil Dash, SoftTech Venture Consulting’s Jeff Clavier, and others. I must hand it to the programmer or QA engineer who came up with that test case. Too bad, as best I can tell, it’s totally wrong. 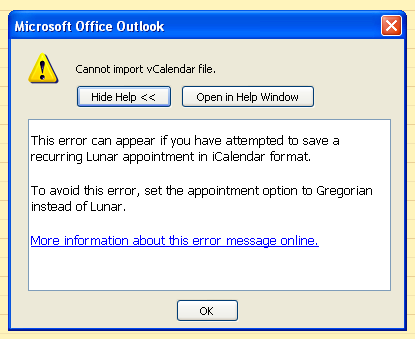 Unless, of course, Evite’s moved over to the lunar calendar.